Are you fulfilling your God-given call? Do you even know what God has ordained for your life? If not, you’re certainly not alone. Being unsure of God’s plan for our lives is common among Christians, but it shouldn’t be (Eph. 5:17). How can we ever expect to build God’s kingdom if we don’t know what our part in it is? The first step to fulfilling God’s will for your life is to realize that the Lord has a specific calling and plan for you. "The word of the Lord came unto me, saying, Before I formed thee in the belly I knew thee; and before thou camest forth out of the womb I sanctified thee, and I ordained thee a prophet unto the nations." Now, you may not be called to be a prophet like Jeremiah, but just like the Lord had a plan for Jeremiah’s life, He has a plan in mind for you. You aren’t a mistake going somewhere to happen. You haven’t been placed on this earth by chance. Where and when you were born, the parents God gave you, your personality, and everything else about you was orchestrated by God for a specific purpose. However, you can’t assume that God’s will is automatically going to come to pass in your life, or in anyone else’s for that matter. If you take a look around, that’s pretty obvious. For instance, it’s clear from Scripture that God wants everyone to come to repentance and be saved (2 Pet. 3:9), yet we know not everyone does. God also wants everyone healed, yet people still live with sickness in their bodies. In the same way, God wants everyone to find and walk in the purpose He has ordained for them, yet not everyone will. But that’s not God’s fault. It’s up to us. He’s done His part; now our part is to discover what His will is. Once you realize that God has a specific plan for your life, the next step is to start seeking Him for it. The good news is, He’s not hiding His will from you. "Then shall ye call upon me, and ye shall go and pray unto me, and I will hearken unto you. And ye shall seek me, and find me, when ye shall search for me with all your heart. Notice the emphasis on seeking with all your heart." Notice the emphasis on seeking with all your heart. As long as you can live without knowing God’s will for your life, you will. But when you seek with all your heart, you will find it (Matt. 7:7). When I was a senior in high school, I realized I was going to have to make decisions about my future that would determine the rest of my life. One thing I believed very strongly was that God had a plan for my life. I didn’t have a clue what that plan was, but I was determined to find out. So, I began seeking the Lord. These verses promise that if (1) I presented my body as a living sacrifice and (2) I renewed my mind, then (3) I would prove the good, acceptable, and perfect will of God. Bingo! 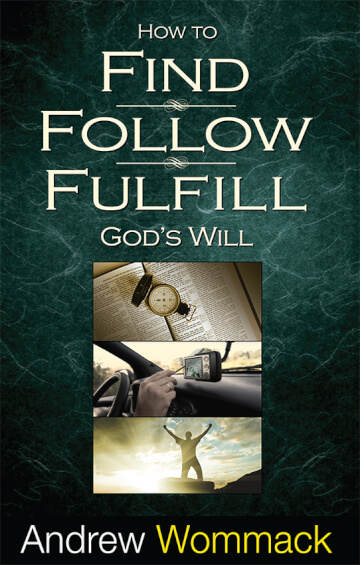 I had found a key to fulfilling the will of God! So, I began a four-month study of what it means to be a living sacrifice and to renew my mind. Shortly after that, I had my life-altering encounter with the Lord on March 23, 1968. And within sixty days, I was led to make radical decisions that set my life on a course that has brought me to where I am today. The bottom line is, everything God has done in my life over the last fifty years began with me seeking Him to know His will for my life. This was the starting point. But it isn’t enough just to know God’s will. You have to learn how to follow and fulfill it too, which means learning how to cooperate with God to bring His will to pass. Some people get into trouble because they try to carry out God’s will in their own natural talent or strengths, or they try to skip out on critical preparation time. Others miss it in the area of obedience. They don’t understand that if you want to finish your race strong and do all that God has planned for you, you must obey the steps God gives you. There are no shortcuts!